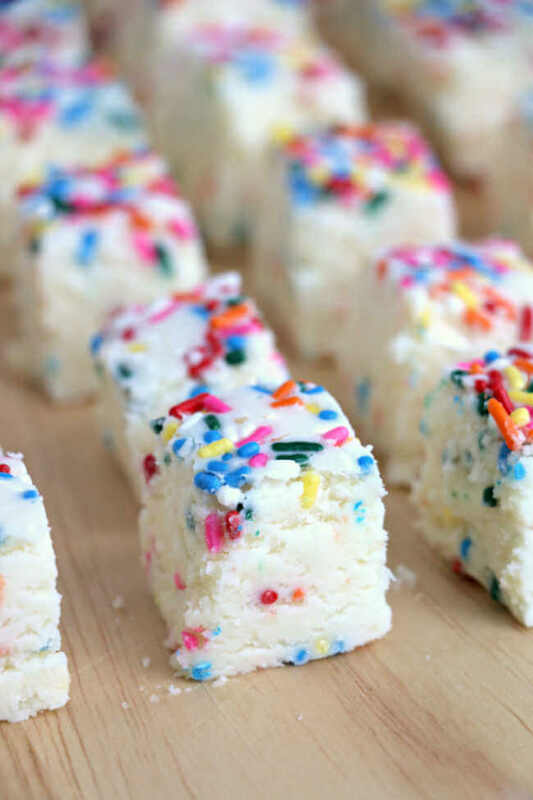 In search of a sweet white chocolate treat? 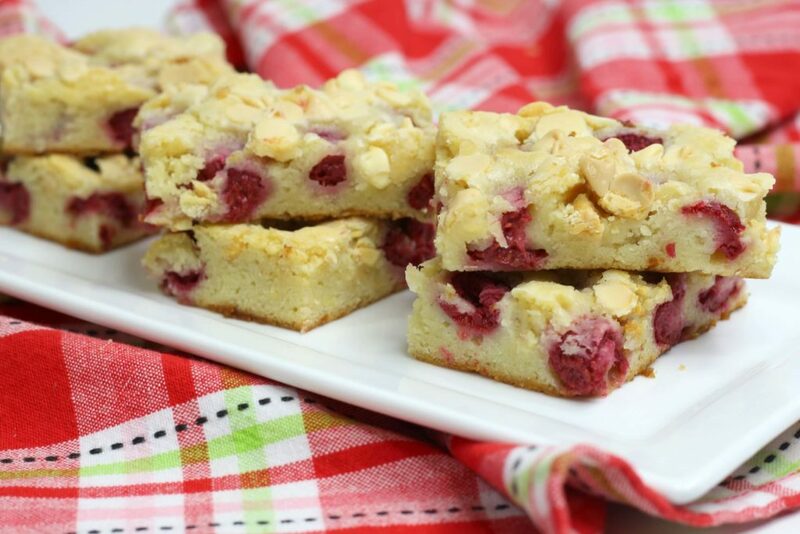 These white chocolate and raspberry blondies are just for you! A fun alternative to a classic brownie, these white chocolate blondies are sure to satisfy your sweet tooth. When it comes to sweets, I tend to be pretty consistent in what I pick. If I had to pick between chocolate and vanilla, I will pick vanilla 9 times out of 10. Don’t get me wrong, I like chocolate. A lot. (See my salted caramel brownies, chocolate zucchini bread and my almond joy bites.) But I love a good vanilla dessert with chocolate IN IT. It’s like the best of both worlds! It took me awhile to realize my true love when it came to desserts, but I have embraced it and run with the white chocolate recipes. 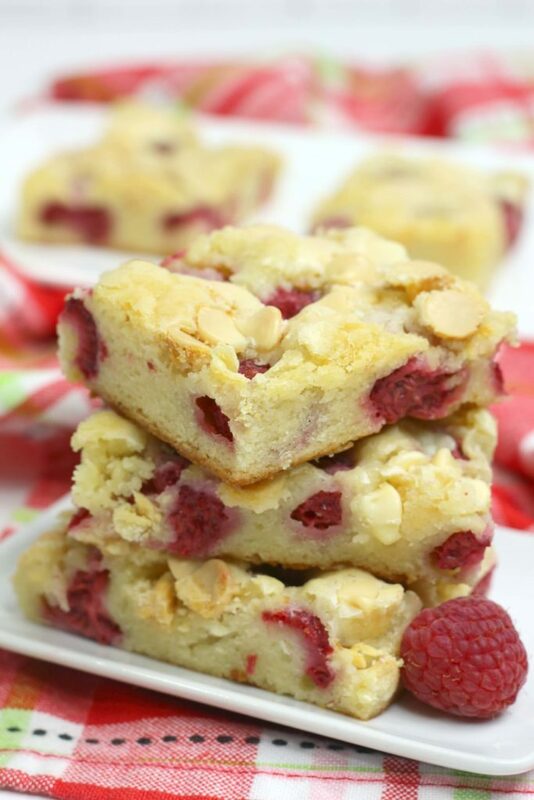 These white chocolate blondies with raspberries are the best of allllll the worlds. What is a white chocolate blondie? Blondies are similar to brownies in texture but there are a few key differences. Brownies are made with cocoa powder while blondies play off the flavors of he brown sugar. Blondies sort of give off a butterscotch vibe over the traditional chocolate brownie. 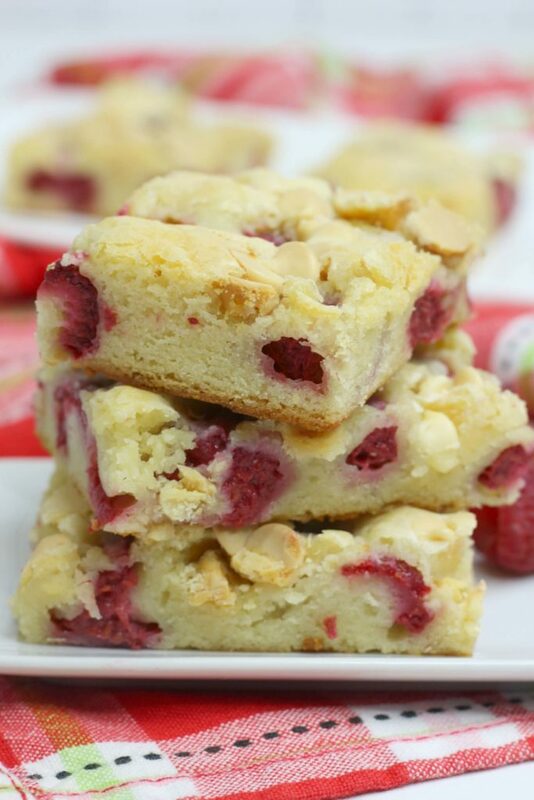 Now add in white chocolate and raspberries and you have like, the best blondies. 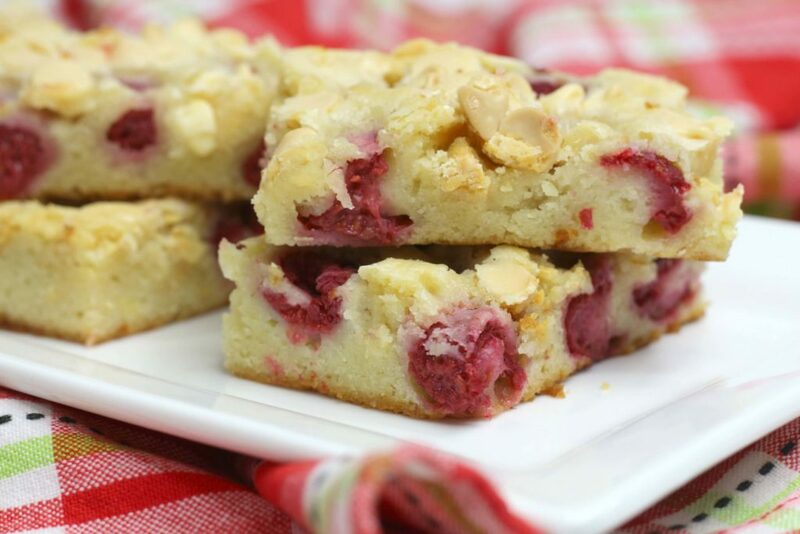 You can add anything into these white chocolate blondies but I really enjoy the raspberry/white chocolate combo. 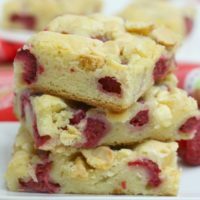 One of the best things about these white chocolate and raspberry blondies is the ingredient list is fairly simple. To be honest, the most “exotic” ingredient on the list is probably the white chocolate. The butter, sugar, salt and eggs are pretty basic ingredients and probably don’t need much explanation. I would suggest using an unsalted butter if you plan to add the salt in this recipe. 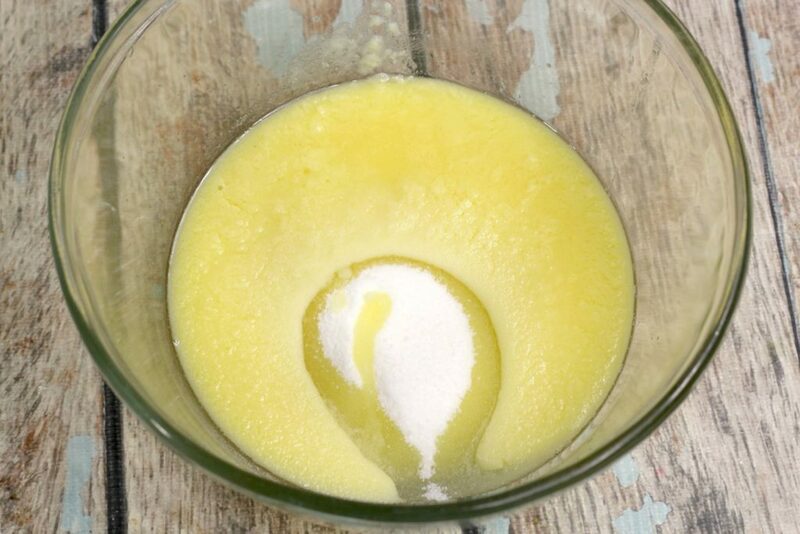 If you want to use salted butter, omit the salt later on in the recipe. I love using homemade vanilla extract in my desserts, but a good quality store bought works just as well. Homemade vanilla extract also makes a great gift around Christmas-time. Any type of flour works in this easy blondie recipe. 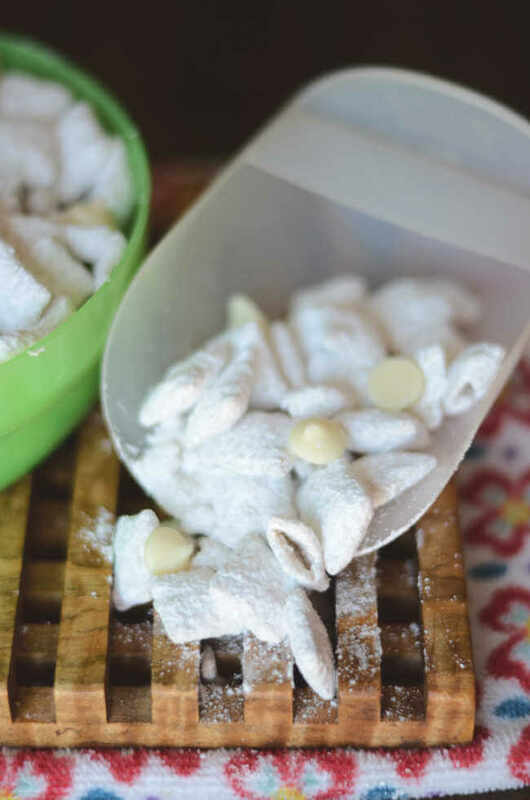 You can easily make this recipe gluten free by using a gluten free flour blend. The last ingredient on the list is raspberries. Fresh raspberries are what I would recommend in this recipe. You can also replace the raspberries with fresh strawberries, blueberries or even blackberries. Start by melting the white chocolate in a double boiler. If you don’t have a double boiler, you can make a faux one with a heat resistant bowl on top of a pot. Put a few inches of water in the pot and allow the condensation to gently melt the chocolate. Transfer the melted chocolate to another bowl (if using a double boiler) and mix in the sugar until smooth. Next, mix in the eggs one at a time, followed by the vanilla extract. Once you have the wet ingredients, carefully pour in the flour and salt. Mix until smooth and add in some of your white chocolate chips and raspberries. 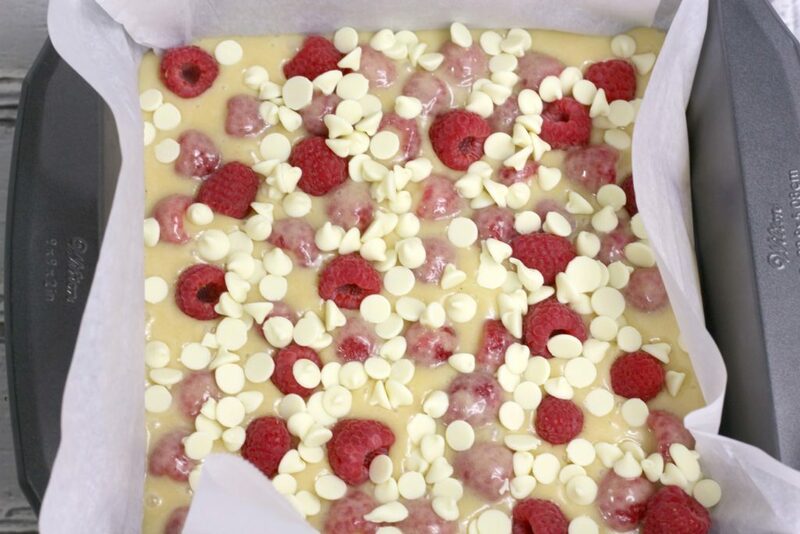 Pour the mixture into your parchment paper lined 9×13 baking and top with the remaining white chocolate chips and raspberries. Bake at 350 degrees Fahrenheit for 20 minutes. You want to remove the dish, cover with tin foil and bake for an additional 5 minutes. Remove from oven, allow to cool, cut into slices and enjoy! These white chocolate blondies are a delicious alternative to the classic chocolate brownie. 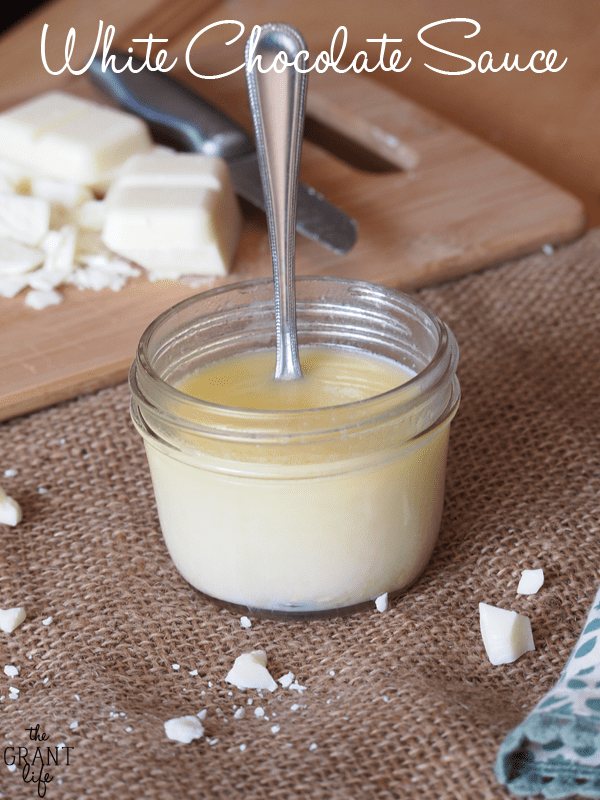 Using a double boiler, place the white chocolate and butter into the top part of the double boiler. Whisk until melted and completely smooth. Transfer mixture into another large bowl and whisk in the sugar until combined and smooth. Whisk in eggs, one at a time until combined after each egg. 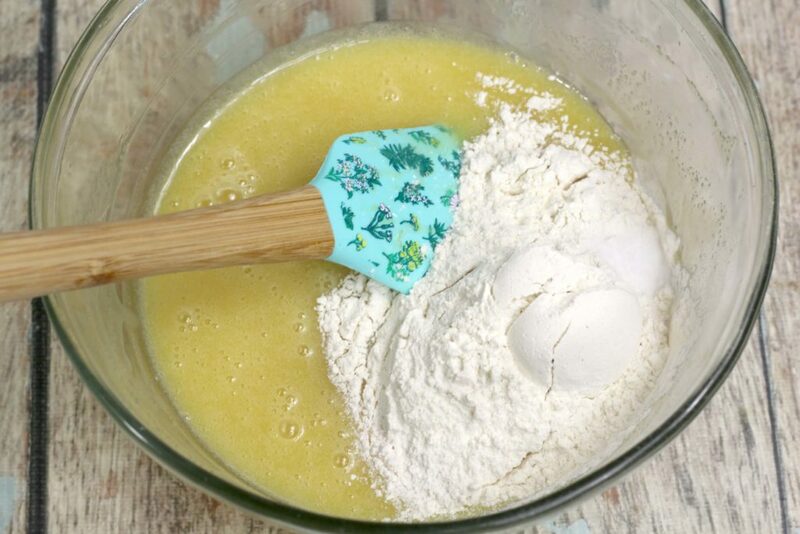 In a large bowl, whisk together the flour and salt until combined. 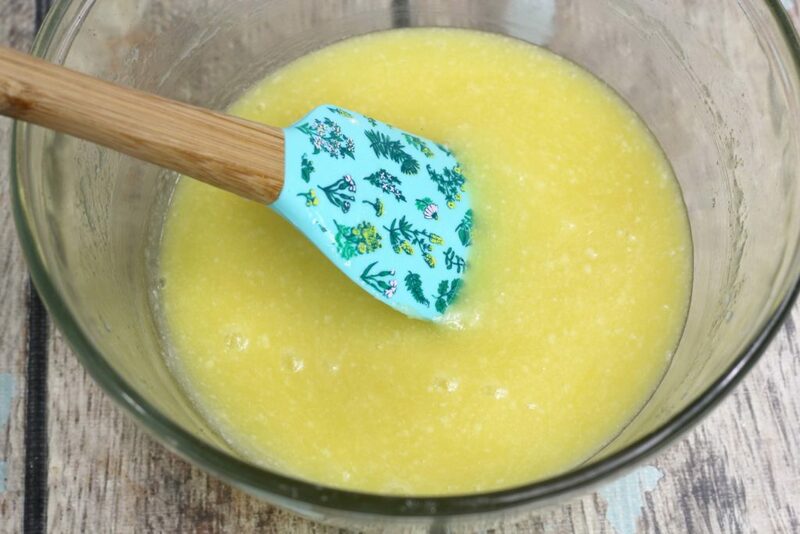 Gradually whisk in the dry ingredients into the wet until combined and smooth. Fold in the 1 C raspberries and 1 C white chocolate chips. Top remaining 1/2 C raspberries and 1/2 C white chocolate chips onto the top of the batter. Bake in the oven for 20 minutes, or until top is golden brown and a toothpick comes out clean. Cover pan with foil before baking for an additional 5 minutes.